Friends Meeting House (1700), Newport, Rhode Island. Of course if 1700 is the correct date for this meeting house, it belongs to the 17th century, where it also appears. Gilbert Stuart Birthplace (1750), Saunderstown, Rhode Island. 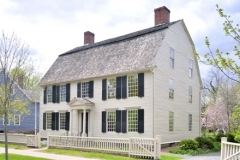 The renowned portrait artist was born here in 1755. 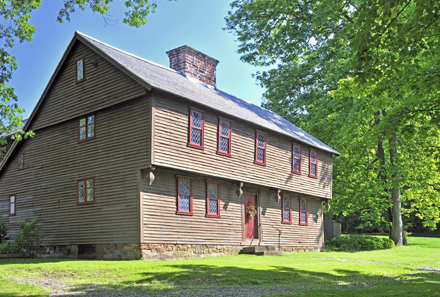 Governor Jonathan Trumbull House (c1738), Lebanon, Connecticut. 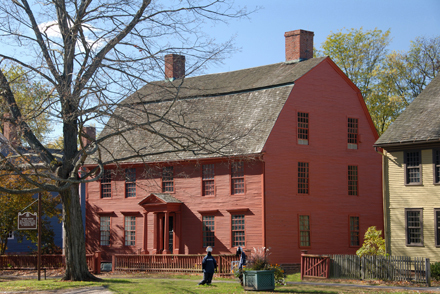 Trumbull was the only colonial governor to support the American Revolution. 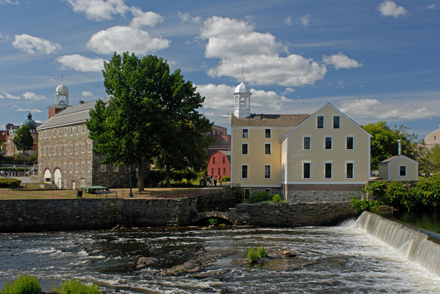 Connecticut became an important base of supply for the Continental Army. Hunter House (1748), Newport, Rhode Island. Gambrel-roof balustered Georgian with broken scroll pediment sheltering the usual pineapple over the pilastered front entrance. 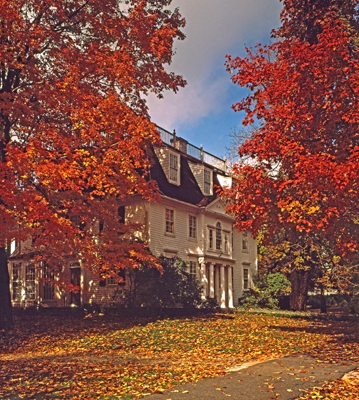 Sheldon's Tavern (1760), Litchfield, Connecticut; In fall color. Double hipped roof with balustrade. Central pavilion with Palladian window. 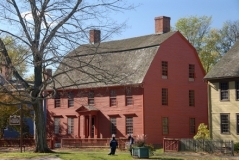 The building served as a tavern in the late 18th century. 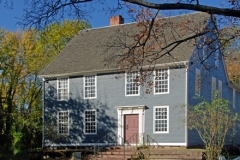 Joseph Webb House (1752), Wethersfield, Connecticut; 2011 image showing new paint scheme. Webb's son Samuel Blatchley Webb commanded a regiment of the Connecticut Line in the American Revolution. He was held prisoner by the British for some time. Silas Deane House (c1770), Wethersfield, Connecticut. 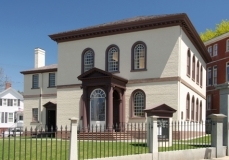 Part of the Webb-Deane-Stevens Museum. Deane was instrumental in procuring supplies for the American Revolutionary War in France. He became embroiled in controversy over accounting matters and lost faith in the American cause. After the war he lived in exile in Europe. 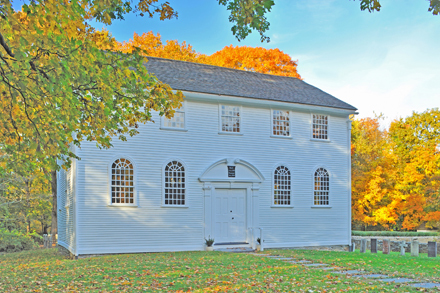 Old Narragansett Church (St Paul's) (1707), Wickford, Rhode Island; View in fall color. 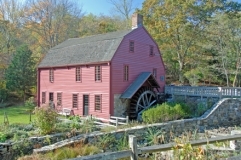 Moved to its present site in 1800. 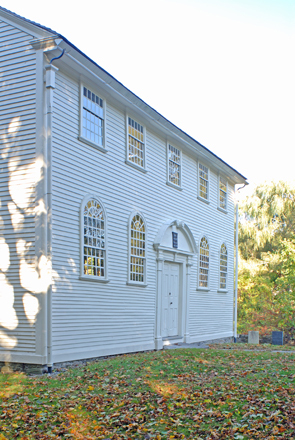 A simple, but lovely New England colonial church with a broken-scroll pediment over its double door and arched windows at ground level. 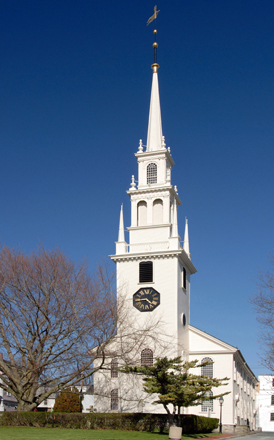 Old Narragansett Church (St Paul's) (1707), Wickford, Rhode Island; Profile. 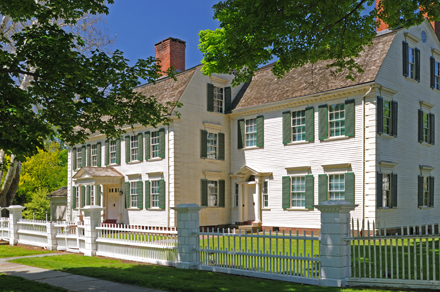 Oliver Ellsworth House (1781), Windsor, Connecticut. Ellsworth's distinguished career included service as a delegate to the 1787 Constitutional Convention, US Senator, third Chief Justice of the United States Supreme Court, and commissioner to France in 1799. An unusual feature of the house is the two-storied columned entrance porch on the south end. 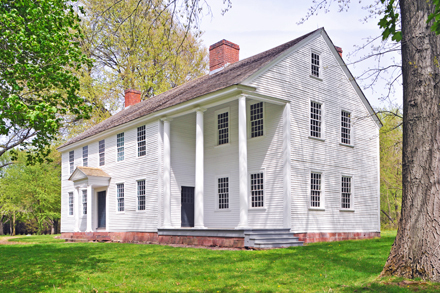 Phelps-Hatheway House (1761 enlarged 1794) Suffield, Connecticut. Original section center chimney, gambrel roof, quoins, Doric portico over entrance. This is well matched by the extension which also has an Ionic columned angular pediment at its entrance. 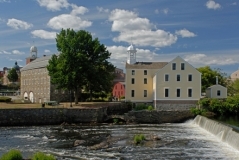 Slater Mill, Pawtucket, Rhode Island on the Blackstone River. 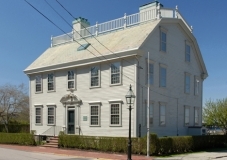 The early building dates from 1793. Said to be the first water driven mill in North America to use a system of spinning cotton developed in England by Richard Arkwright. Stanley-Whitman House (c1720), Farmington, Connecticut. 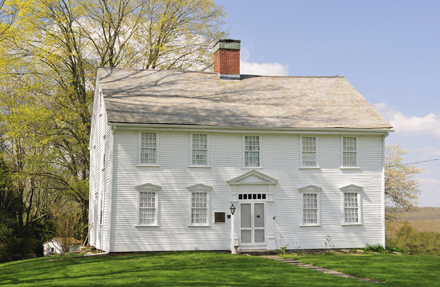 Another 18th century house of "first period" appearance with center chimney, overhang or jetty and pendants or drops. 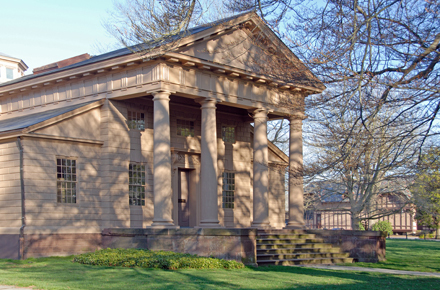 Redwood Library and Athenaeum (west facade 1749), Newport, Rhode Island. 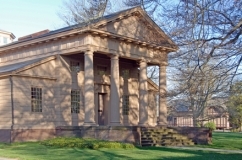 Peter Harrison here introduced the classical Palladian style to the colonies.Note the Doric frieze atop the columns and the rusticated woodwork in imitation of stone. Touro Synagogue (1763), Newport, Rhode Island. Peter Harrison here contrasts a quiet, restrained exterior with rich Georgian decorative elements inside (next). 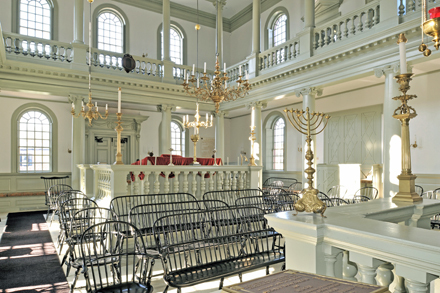 Touro Synagogue (1763), Newport, Rhode Island; Interior looking west.Here Peter Harrison has created an impressive interior, blending a variety of Georgian decorative elements with religious architectural requirements. 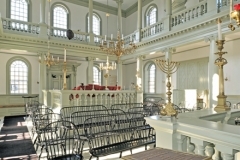 Touro Synagogue (1763), Newport, Rhode Island; Interior from gallery looking east. Again we see the richness of Peter Harrison's work. Trinity Church (1726), Newport, Rhode Island; Spring view from Queen Anne Park. 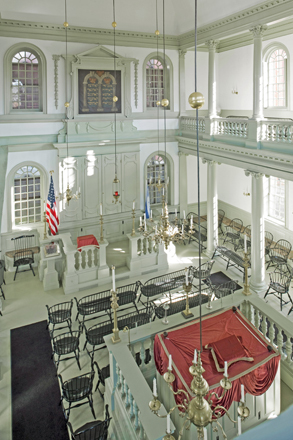 Designed by Richard Munday who is responsible for Colony House, Newport, as well. 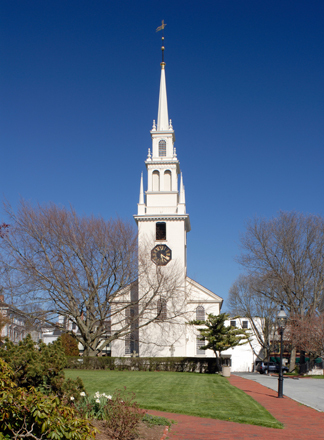 Much of the church - particularly the tower - resembles Old North Church in Boston, Massachusetts. 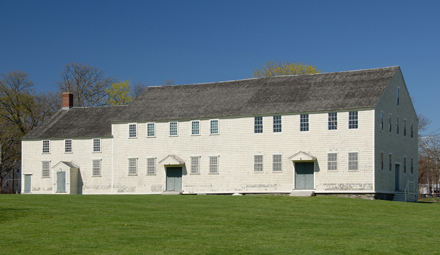 Trinity Church (1726), Newport, Rhode Island; West facade and tower.